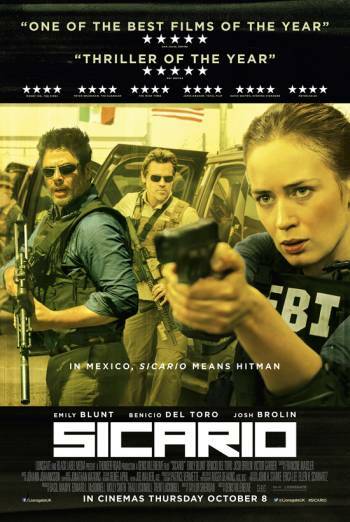 Totally engrossing, often pulse-pounding, and armed with a realistic sensibility, Sicario tells the story of an FBI agent in the drug war (Emily Blunt) recruited by a U.S. government task force and its consultant (Josh Brolin and Benicio del Toro, respectively) to assist with an exfiltration of a drug lieutenant and then a targeting of a Mexican drug lord. As Blunt gets deeper into the mission, the motives of the players and other aims of the endeavor are revealed. Blunt is excellent as a hardened officer who struggles with the seeming futility of her job and the machinations around her. Who would have thought that the arch, bony fashion assistant in The Devil Wears Prada was capable of projecting such strength, but this is the third role where I’ve seen Blunt play a convincing, strong, physical woman (the others are Looper and Edge of Tomorrow). By that, I mean that she doesn’t shed gender and its attributes, nor does she just merely ape a man in what is a male-dominated role, where she’s chucking men around because, hey, that’s equality! She has a scene of physicality where the director demonstrates not only Blunt’s own strength but its limitations when pitted against a strong man. It’s real and its authenticity melds perfectly with the film, which is gritty and direct and doesn’t have much use for gesture. On the downside, while Blunt can convey heart and strength, she can’t create a character where one does not exist, and writer Taylor Sheridan’s first screenplay doesn’t provide her one. There’s nothing that makes you claim or invest in her, and the moody, sparse setting of the film and Blunt’s no-nonsense portrayal can only go so far. It’s a testament to the taut pacing of the picture that you don’t recognize its emptiness until afterwards. Still, a good watch.